Fill your home with the delicious scent of freshly-cut freesias. A fabulous collection of double-flowered freesias to bring a mixture of colours and perfume to your garden. Gorgeous, trumpet-shaped freesia flowers with a delicious fragrance are produced above the narrow, lance-shaped leaves. Easy to grow, freesias thrive in a sunny spot in well-drained soil and are a great candidate for a pot in a sunny greenhouse or conservatory or on the patio. A cut-flower favourite and a popular cottage garden plant, you can keep your home filled with the delightful scent of fragrant, fresh-cut blooms. Supplied as a collection of 50 mixed-colour freesia corms. 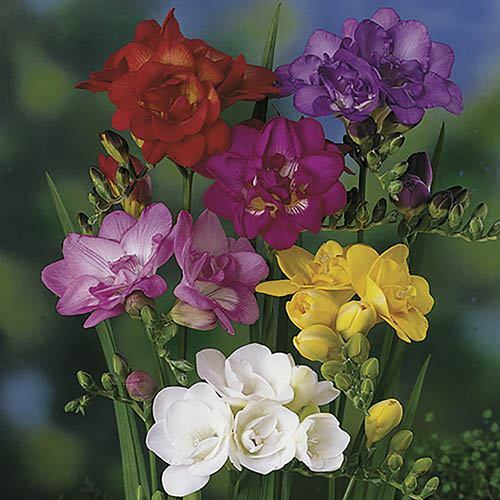 These stunning double blooms will flower more prolifically than the single-flowered varieties, producing gorgeous, trumpet-shaped freesia flowers with a delicious fragrance above the narrow, lance-shaped leaves. A native of South Africa - we tend to think that growing them in the UK will be difficult, but this isn't the case - they're really easy! Freesias grow well in a sunny spot in well-drained soil and are a great candidate for a pot in a sunny greenhouse or conservatory or on the patio. A cut-flower favourite and a popular cottage garden flower, you can keep your home filled with the delightful scent of fragrant, fresh-cut flowers. Supplied as 50x mixed double flowered freesia corms. If you're wondering what month to plant your freesias, then April-May is the ideal time! Try planting your corms at intervals of 7-10 days to get a continual display of flowers throughout summer. Freesias are a corm as opposed to a bulb, and can be planted outside from April - May. Plant straight into the ground, pointy end upwards, in a well-drained spot in sun or light shade. Growing plants benefit from a potash-rich feed. Plant six bulbs 1-2in deep. Use a good quality compost with a little extra grit for drainage. Water regularly and keep them moist (but not soaking) and shaded at all times – a cold greenhouse or conservatory is ideal. Once the corms start to sprout, move the pots into full sunlight and keep watering. When the buds show colour, you can bring them indoors. After flowering cut off faded blooms and continue to water and feed until the foliage begins to brown, then cease watering. A period of at least eight weeks of growth is required to encourage offsets. If growing on for a second year the foliage needs to dry off by early July.